Good things come to those who wait, or so the saying goes. If that&apos;s the case, then the owners of Linda Lou should be reaping the rewards tenfold. It all started sometime in 2002—the husband half of the owners isn&apos;t quite sure of the exact date, you see, as by his own admission, he and the Lrssen team met "over a lot of time" to determine what size and style yacht he and his wife wanted. And on top of that, "I went over the [accommodations plan] development for quite some time before signing" the contract, which he finally did in March 2003. After a pause or two, he reflects, "I wonder if they wondered whether I was serious about building a boat because of that." 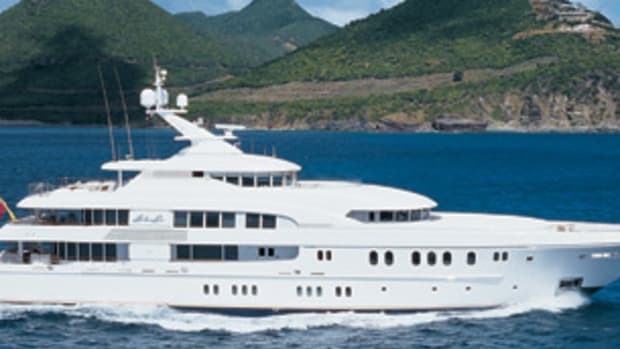 Linda Lou changed dramatically in the planning stage, resulting in a 192-foot Lrssen that faithfully fulfills the owners&apos; avid cruising lifestyle. Ultimately the Lrssen team knew he was, and so the contract was signed for a 50-meter (164-foot), shallow-draft yacht, ideal for Bahamian and Caribbean cruising. 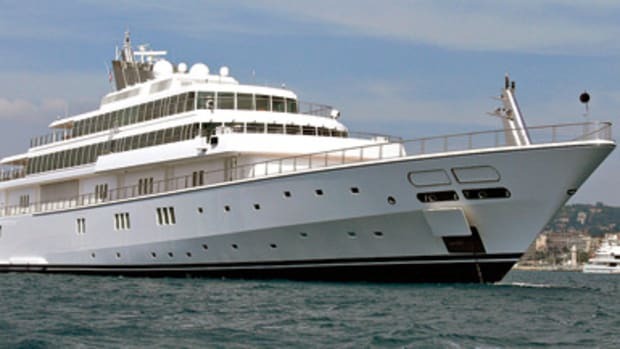 Although she represented about a 30-foot step up in size from their previous yacht, the owners and their team, headed by Capt. Ingo Pfotenhauer, the well-known former captain of the 204-foot Virginian, looked forward to the collaborative effort. And then the owners changed their minds. 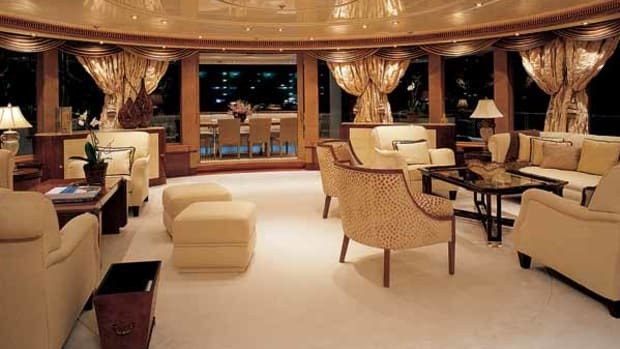 According to the husband, when the Euro-to-dollar exchange rate began to favor the Euro, he and his wife decided a larger yacht would present a better resale opportunity down the road. Upon seeing Capri, a newly delivered 192-footer that Lrssen was displaying at the 2003 Fort Lauderdale International Boat Show, they knew they had found their inspiration. Capri&apos;s decidedly family-friendly focus certainly fit the couple&apos;s plans, as did her overall volume. "I always believe in building something they&apos;ve done before," the husband explains. 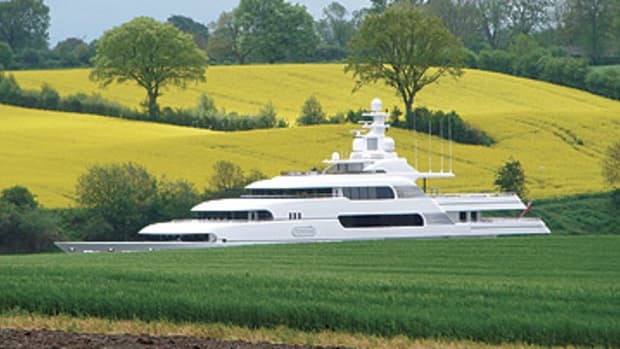 Since Espen Oeino was to be the naval architect for the originally planned 50-meter, the owners asked him to use Capri&apos;s hull as a starting point for a 60-meter (197-foot) yacht. The styling of Linda Lou is all his, however, and incorporates features of particular importance to the owners. For one, they wanted a swim platform that would provide easy access to the water for diving and the boarding and unboarding of tenders and toys, which include a handful of Sunfish sailboats. 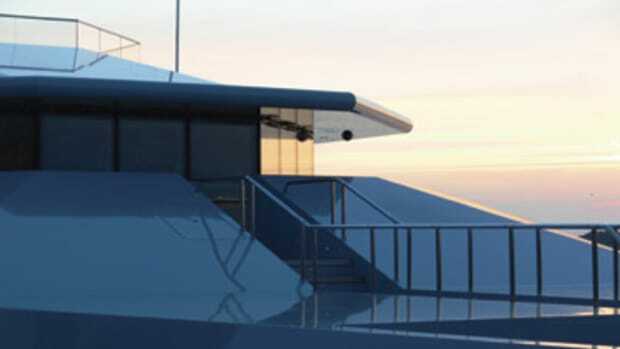 Another desire was to have voluminous, full-beam upper-deck spaces, particularly the sky lounge, which required eliminating the familiar walkaround bridge deck and positioning the air trunks farther outboard on that level compared to other yachts. 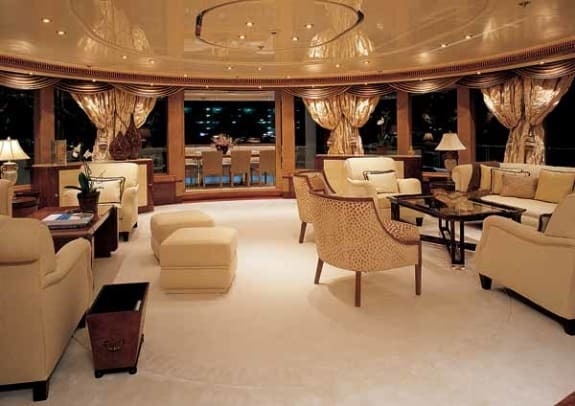 For that voluminous interior the owners tapped Franois Zuretti to create a look with timeless appeal; while there are both contemporary and classic elements throughout the yacht, no single area is a throwback to an earlier era or risks looking dated in a few years. For example, instead of using one type of wood with one type of finish throughout a room or even an entire deck, Zuretti and the owners opted for a mixture of tones and textures. 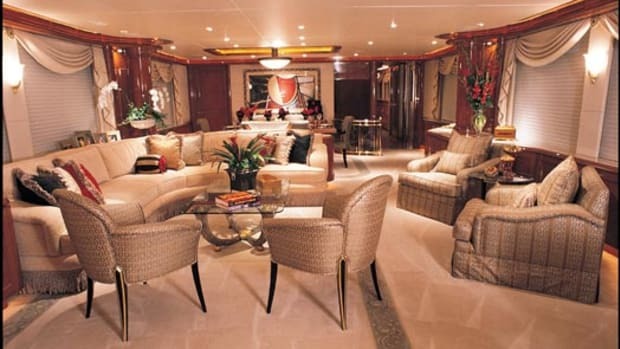 An effective example is the skylounge, where reddish-brown lacewood has been treated a variety of ways on the furnishings and walls (themselves eschewing straight lines in favor of flowing curves): Some panels are simply stained, while others are bleached and then hand-rubbed to create a metallic sheen, then lacquered. The sole leading through the lobby forward of here into the wheelhouse is teak, while the walls are madrona, distinguishing the rooms from one another yet avoiding too dramatic a change.